This Naturally fat-free fruit vinaigrette adds a rich and elegant presentation to any salad. Excellent as a marinade too! Absolutely bursting with wild huckleberries. 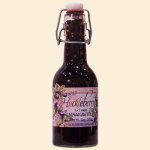 Ingredients: Wild Huckleberry Juice, Wild Huckleberries, Apple Cider vinegar, Red Wine Vinegar, White Grape Juice, Water, Honey, Sugar, Cinnamon, Xanthan Gum, Salt, Potassium Sorbate.